The Mini Thermal Vest was originally designed for charity knitting, but is also appropriate to knit for your family and friends. It was inspired by the Keep Me Warm Vest, but knit in lighter weight yarns for younger children, to help keep the core body temperature of infants warm. 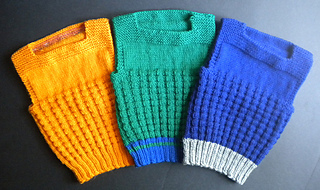 All sizes are knit using 100 sts. Size changes are accomplished by changing gauge (yarn weight and needle size, per the information in the pattern). Sizes are based on YarnStandards.com measurements with some extra length added to keep babies warmer and to allow room for growth. Slight gauge variations are quite acceptable. 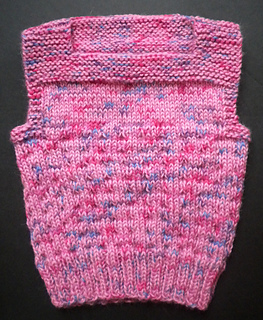 When knit for a charity group, your finished vest will find a baby who needs that size. 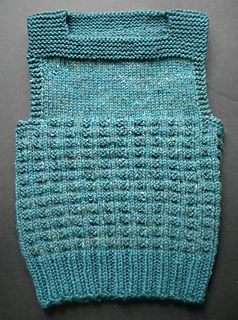 The vest is knit in the round from the bottom up. It is divided for the armholes, then the front and back yokes are knit flat (back and forth). Finally the front and back are joined using a 3-needle bind off. There are no stitches to pick up and no seams to sew. with Rnd 4 this measurement includes the ribbing. Many thanks to my test knitters. 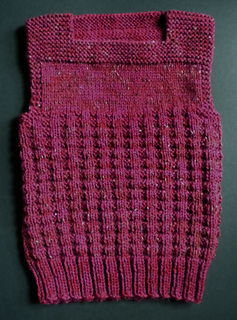 Please see the pattern project pages for knitters’ information and yarn ideas.